© 2015 by Sofia Samatar. Originally published in Guillotine #10. Reprinted by permission of the author. We are familiar with gold, says Hume, and also with mountains; therefore, we are able to imagine a golden mountain. This idea may serve as an origin myth for Iram, the unconstructed city. The city has several problems. (1) It is lacking in domestic objects. (2) It is lacking in atmospheres that produce nostalgia. In cities without the correct combination of—for example—hills, streetlights, and coffee, it is difficult to get laid. A playbill in a gutter, bleeding color, the image of a famous actress blurring slowly into pulp: This would be perfect. The word playbill is perfect. There are many ways to achieve the desired conditions. Iram has none. No continuity without desire. There is no desire in Iram; the time of Iram is not yet. The reversal of time expressed in these lines is impossible in Iram. In Iram, there is nothing to reverse. Every time I go there, I see my uncle on the same bridge, and he raises his hand to greet me in the same way. He always tells me not to say every time, but I can’t help it, it’s a habit. He wishes I had come to visit him in Jeddah. I couldn’t go, I tell him. It would have meant an expensive trip. I would have had to wear an abaya. I couldn’t do it. My uncle is not at all angry. Well, he says. He pats my shoulder. Well. He’s wearing the most magnificent orange suit. Like my father, who is waiting for us at the restaurant, my uncle has style. The men in my family are all very beautiful. When I say that Iram is lacking in domestic objects, I mean that we haven’t gathered enough. I try to bring something with me every time. Last time it was a collection of my father’s audiotapes, crammed into a pair of black plastic bags. The tapes are dusty with cigarette ash and poetry. It is only possible to listen to them in the worst light. A white, ugly, institutional light that, despite its harshness, is too weak to travel more than a couple of feet. Fortunately the tapes create the sort of light they need. At the restaurant, my father has already ordered. As always, he’s gotten the huge appetizer plate, more than a hundred appetizers arranged around a bowl of blue flame. I kiss his cheek. He waves, expansive: Sit down! It’s important to order the biggest thing. The entire restaurant must smell my father’s cologne. In Iram, this makes me happy. This is the good life. I don’t know what the blue flame is made of, but it keeps everybody warm. My mother says: Your father had beautiful skin. This was before he began to suffer from psoriasis. Now he goes out in a hat and gloves, even on the hottest days. My father has become allergic to sunlight. How is that possible, my mother asks. He’s a Somali, he grew up in the sun! My father puts on his hat and goes out to his car. His beautiful skin, my mother says sadly. The car starts up: a throbbing sound that remains, for me, after all these years, synonymous with fear. The car pulls into the driveway. The children hear its long, low note. They hear the door slam. The children run upstairs and hide inside their rooms. They’re giggling because it’s beautiful and exciting to be a child. They’re smart; like bugs, they can squeeze into any kind of space. The children make bug-nests for themselves out of torn-up letters and photos. They squirm around in the nests and eat a lot of paper. The children are going to turn out fine, but they’ll be the kind of people who do not have many things they can take to Iram. In a city where one could find—for example—dogs, graffiti, and palm trees, it would be possible to fall in love. Have you not considered how your Lord dealt with Aad, with Iram—who had lofty pillars, the likes of whom had never been created in the lands? And with Thamud, who carved out the rocks in the valley? And with Pharaoh, owner of the stakes? All of whom oppressed within the lands, and increased therein the corruption. So your Lord poured upon them a scourge of punishment. The Wikipedia article on Iram warns: This article needs attention from an expert in Archaeology. The specific problem is: The article is a confusing mix of myth, supposition, popular sources and very little science, scholarship, or sense; the result is a meaningless overview of the subject, accompanied by random facts and inexplicable leaps of logic. According to the article, Iram is also known as the City of the tent poles. It is a lost city or perhaps a tribe. The passage from the Qur’an quoted here appears in the article. A note at the end reads: translated by error. I walk to the restaurant with my uncle. There’s nothing, no atmosphere. It’s like anywhere. Iram, the windless city, is buried underground. I wish there were more of a glow so that I could see my uncle’s suit. Once, I remember, I told a friend I was disgusted by the idea of a Daddy-Daughter Dance. So heterosexist, I said. I mean—ugh! My friend said she had gone to a dance like that with her father when she was a little girl. Magic, she said. If there were a glow, I could take my uncle’s arm. She felt so special. It was the happiest night of her life. In Iram, my uncle understands me perfectly. I realize we’ve been speaking in Somali. We sing the song about the Prophet Issa’s birth, the one about the darkest night. The very darkest night. It almost doesn’t matter that I’m carrying these awkward plastic bags. In the window of the restaurant, there’s a small blue light. My father waits for us inside. It’s the way I told you before. Happy, happy. I’m the only woman there. There are hardly any women in Iram. This is a problem, because without women, nothing happens. Nothing goes on without them. You will have realized at once that there’s a connection between these missing women and the missing domestic objects. In Iram, there are windows but no curtains. I’m not saying women have to create these objects, I’m saying they do. Sometimes, after dark, I catch sight of a woman just disappearing around a corner. I recognize her from her photograph. According to the ninth edition of the Encyclopaedia Britannica, Iram is a lost city which yet, after the annihilation of its tenants, remains entire, so Arabs say, invisible to ordinary eyes, but occasionally, and at rare intervals, revealed to some heaven-favoured traveller. I write on a scrap of paper: Q-tips. Deodorant. Small hand lotion. I have a terrible longing to visit Iram again. I’m full of plans. I want to take a beaded wooden spoon with me next time—I think it’s somewhere in my parents’ house. The Somali pillow, too, and the little stool we used to call the African Stool. I’m sure that, when I reach Iram, I will know its true name. Perhaps that sounds romantic, but I believe things have true names. I believe everything has a name that I don’t know. In the restaurant, my father and uncle laugh together. My father grips my uncle’s shoulder, chuckling naturally and with pleasure. It’s not the explosive, uncontrollable laugh that seized him in our house the night some Somali guests came for dinner. My father had invited them. Everything was going well, and then something happened—I believe my brother made a face at one of his kids—and my father started laughing and couldn’t stop. I remember we all laughed, too; we kept telling each other how terribly funny it was. Our guests smiled politely. You have to understand that at this time it was very rare for my father to eat with us, even rarer for him to invite guests to the house. The production of a normal family required immense effort. We were all keyed up to the highest pitch of excitement. My father’s laughter seemed to go on forever, past bearing. At one point I felt pinned inside it. I couldn’t move. Later I would experience that kind of laughter myself, when I was working in South Sudan during the war. When you’re outside, you can picture exactly what you want it to be like, but once you get in, all you can do is follow along. You can help me. You can tell me if these feelings are universal. What is normal? I’ve felt for a long time that normal is something suspect, that embedded in the idea of the normal is something dangerous, an erasure of everything abnormal, a death or a series of deaths. But isn’t it actually normal to want to be normal? I would like to build an entire philosophy out of Iram, the absent city. This philosophy would serve all the children of immigrants, many of the immigrants, and many others who found themselves at a loss. Eventually people would come to say: This philosophy is available to all. Anybody can go to Iram. All sorts of people, many of whom looked nothing at all like me, would disembark in the unconstructed streets. They’d bring their own bags, their photographs, their desire. Early in the morning, you’d find teenagers putting up playbills on the walls. Their sense of satisfaction would be so strong, it would color the air. For the first time, Iram would have a color of its own. But of course that can’t happen until we import more objects, until we have succeeded in creating the conditions for nostalgia. For this reason, I fear that my feelings are not universal. Surely love cannot exist outside of time. It depends upon small objects. The fact is, when my uncle died, he and my father were barely on speaking terms. My mother told me that my father disliked my uncle’s gifts, specifically the gifts my uncle gave to my mother and me: gold jewelry, dresses heavy with beads. My mother, who is often sad, and not without reason, was sad because of this split between my uncle and my father. She and I wore our glittering beaded dresses to a New Year’s Eve party. Everyone said we looked beautiful, exotic. My father didn’t go to the party. My father went somewhere else. I don’t know where. Perhaps he was helping to draft the Somali constitution. When he disappears, I always imagine him doing heroic work. Once someone asked if I thought he worked for the CIA. I said I don’t know. We never eat anything after the appetizers. We’re drinking tea from my uncle’s thermos. My father and I use cups and my uncle uses the lid. In the radiance of the cobalt flame in the center of the table, of my uncle’s marigold suit, I am dreaming of things to bring to Iram. I wish I could bring a bathroom door from the library at the University of Wisconsin–Madison, but how would I take it off, how could I get it out of the building? I’m picturing myself in the snow and ice, sliding down State Street with the big gray door clasped somehow under my arm. Impossible. And anyway, I don’t know if that object would work. I don’t think it’s sacred in the way that a piece of cloth worn by a relative is sacred. Something that holds perfume. The door of a public bathroom stall—it’s so anonymous, it doesn’t even hold the imprint of my shoe. The imprint of my shoe where I kicked the metal door in a rage. A Somali student had told me his name was Waria. I knew it wasn’t a name. He was making fun of me. It couldn’t be a name, because it was just a sort of word. It was just something you said, not you but my father, on the phone. A sort of preface, like Hey or maybe Hey you. I realized I didn’t know what it meant. Something melted in my face. Excuse me, I said. I went to the bathroom. I question this idea of the heaven-favoured traveller. What kind of favor is it to arrive at an empty city? A city that goes on, lifeless, after the annihilation of its tenants? I’m just standing here on the corner with my bags. To have no one to blame but yourself is to have no one. It’s the worst fate. I want to fall down in Iram. I’ve never tripped or fallen there. It’s the sort of thing you can’t organize; it has to come up and catch you unawares. I want to be caught and thrown to the ground in Iram, to scrape my knee. Look, there’s blood. That’s me. If that happened, I feel certain a new kind of light would arrive. I’d look down at my blood on the pavement, and my blood would show me the edge of a flight of steps. That’s really what it’s called. A flight. If it gets too painful, you can stop. When my uncle died, he left six children. Two sets of triplets. Three boys and three girls. I don’t know them, because my father is on bad terms with my uncle’s widow—in fact, he is estranged from her whole family. My uncle and his wife had their children through IVF treatment. When I was a child myself—long before my uncle’s children were born—I remember being told that my uncle was unable to have children, because of what had been done to him in Somalia, in prison. The woman is smiling in the photograph. I’m on her lap. I’m three or four years old. I asked my mother who she was, but my mother didn’t know; she couldn’t remember; she said, You’ll have to ask your dad. I was getting ready to move somewhere—perhaps Cairo, perhaps Wisconsin. My father had not been home for several days. I put the photograph away with the others. I was afraid to ask, afraid to find out that this lovely woman, my relative, was dead. Now I consider this an act of cowardice. I remember the picture. The smile. It seems to me that one corner of the photograph was cut off. Was someone else there? This woman was happy; she loved me. She smiled so fully, with such golden warmth, as she disappeared around the corner in Iram. Next time, I think, I’ll rush to catch her, I’ll shout, perhaps I’ll fall down in the empty street. But of course there’s no next time, only not yet. At one point I thought I was writing this to force myself to ask my father about the photograph. But I must have lost it, because it’s gone. I can’t ask now. My uncle was shot and killed in his bed. Addis Ababa, 2010. I’m just standing here on the corner, holding my plastic bags. Very little science, scholarship, or sense. I’m just trying to hold them both. Let’s all laugh together. Sweet blue light. Let’s pour a little more tea. Let’s order more appetizers. Dad, let’s stay here, let’s not go. I remember when I was a kid, on long car trips, I’d imagine a giant saw was attached to my side of the car. The saw could cut through anything. It sliced fences, it sliced trees. The fences gave a swift groan and exposed the hollow insides of their poles. The trees went snick and fell over with juicy ease, the tops of the stumps left gleaming moist and pale, like a wound before the blood comes. I was leveling the whole country from my seat in the back of the car. I don’t know why it gave me so much pleasure. The world was coming down to size. I know it sounds like the opposite of what I’m trying to do in Iram, but the feeling is the same. The chapter of the Qur’an that mentions the city of Iram is called al-Fajr. Dawn. Because we are familiar with gold and we are familiar with mountains. Because we are familiar with pillows and spoons. Because we are familiar, we can imagine. Is that true? Look, here I am, at my desk on the highest roof of the city. I sit up here at night so that you can find me if you come. I am listening to my father’s cassettes. You will have noticed that there is sound in Iram, and this is why I come back, I think, to these blank and shrouded streets. I am trying to imagine sound as an object. As soon as I press play the light comes on, that white ceramic glare, and cigarette ashes lift away from the tape recorder and disappear in the air of Iram, where it is always night. Light pins me to my seat. When my father was in the basement listening to poetry, we knew we mustn’t disturb him. The door was edged with grainy fluorescent light, the stairs coated with black rubber. It was a terrible, terrible place. And poetry came up as it comes to me now. I know the words for pearl and water. I am singing of the moon, of a great-limbed tree. Amber necklaces come to me and thorns and rain and a fiery horse and a lonely dhow adrift on a trackless sea. In Iram, I know the names. I sit repeating them, enraptured, frozen in an ecstasy of bad light. No continuity without desire. Look for me if you come. You’ll know me by the falling of my arm. 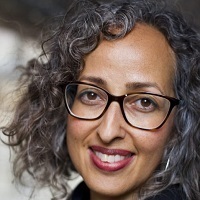 Sofia Samatar is the author of the novels A Stranger in Olondria and The Winged Histories, the short story collection, Tender, and Monster Portraits, a collaboration with her brother, the artist Del Samatar. Her work has received several honors including the John W. Campbell Award, the British Fantasy Award, and the World Fantasy Award. She teaches Arabic literature, African literature, and speculative fiction at James Madison University.